These savory muffins are flavored with garlic scape pesto & ricotta cheese. They bake up quickly for an easy bread to serve alongside pasta, chicken, or fish. Ever make a main dish and think at the last moment, "you know, some hot bread would be great with this"? That's one of the reasons I like muffins--they come together quickly (as in, thrown together while an entree is baking) and usually require just pantry ingredients. Simply pop them into the already hot oven and a few minutes later you've got yourself a hot bread to accompany your meal. Take that, yeast breads! 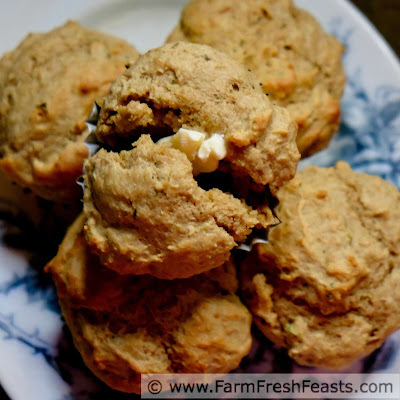 I envisioned these muffins alongside a plate of lasagna, spaghetti & meatballs, or a crock pot pizza casserole where the pesto-ricotta combination can enhance the entree. They'd be terrific with my Pesto Ricotta Baked Swai recipe or my Chicken Spinach Artichoke Pesto Pasta recipe. 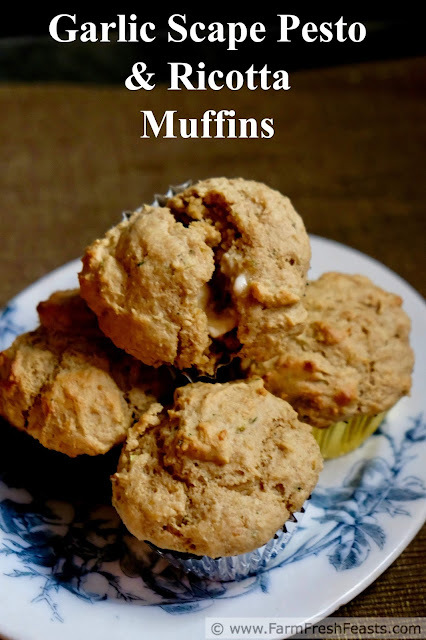 When I made them I was just craving a savory quick bread I could slather in buttery spread and snarf down while standing in the kitchen with my wiener dog, Vincent, at my feet catching the crumbs. True story! These muffins assuaged the craving. I was not interested in having a full pan of muffins to feed a larger group--I just wanted enough for our family--so I filled my muffin cups much fuller than usual. The resulting large muffins took a few more minutes to bake, but Vincent and I didn't mind. This recipe could be stretched into a dozen if you make them smaller than I did. Seasonal eaters will delight in the inclusion of garlic scape pesto in this recipe. If you know what it is and you've got some--go for it. If you're not sure where in the grocery store you'd buy garlic scape pesto, let me give you a Top Tip: it's not there. Use a prepared pesto instead, and check out this Garlic Scape Recipe Round Up to learn more about the wonders of garlic scapes. For more recipes using Garlic Scapes, please see my Garlic & Garlic Scapes Recipe Collection. This collection is part of the Visual Recipe Index by Ingredient, a resource for folks like me eating from the farm share, the farmer's market, the garden, the neighbor's garden, and great deals on ugly produce at the grocery store. Preheat oven to 400 degrees Fahrenheit. Line 8 to 12 muffin wells with paper cups. 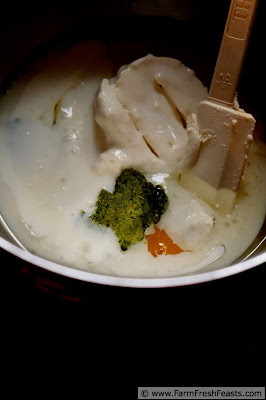 In a large bowl, mix together egg, ricotta, oil and pesto until well blended. Dump dry ingredients on top (everything else but the Parm cheese). Stir just until barely mixed together. Scoop batter into prepared pan, filling up the cups for large muffins or leaving them ⅔ full for regular muffins. If using optional Parm, shake onto muffins at this step. Bake for 18 minutes (large) or 15 minutes (regular) until lightly browned. Cool 5 minutes in pan, then remove from pan. Serve warm with butter. 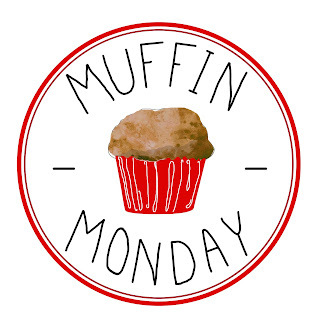 Check out what May Muffin-y goodness we've got for you this month! I no longer belong to my CSA....there was just too much food now that we are empty nesters. Garlic scapes are one of the things I miss the most this time of year. 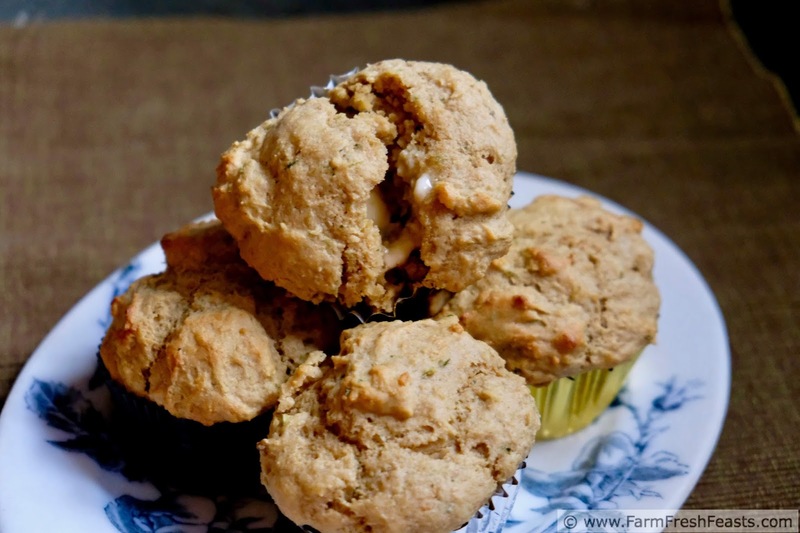 I need to hit the Farmer's Market and make these wonderful muffins. "Too much food" is a common refrain I hear among former CSA subscribers! I've split shares while my spouse has been deployed, and scheduled strategic breaks in the middle of the summer, but still haven't found the magic 'one size fits all' formula for managing the flow of produce. Last year I did see scapes at my local grocery store. It's a chain of 3 stores, so hyperlocal anyway, with quality and customer service similar to Wegman's, if you're familiar with that chain. You never know--worth a look where you live? Otherwise, farmer's market for sure. I am picturing you scarfing these, Kirsten, and Vincent's big eyes just watching for crumbs. We had a wienie dog when I was a child. His name was Hoover because he ran across the carpet and picked things up. I love that you make pesto with garlic scapes. And muffins with the pesto. What a great way to extend their season. How interesting that you included diastatic malt powder. 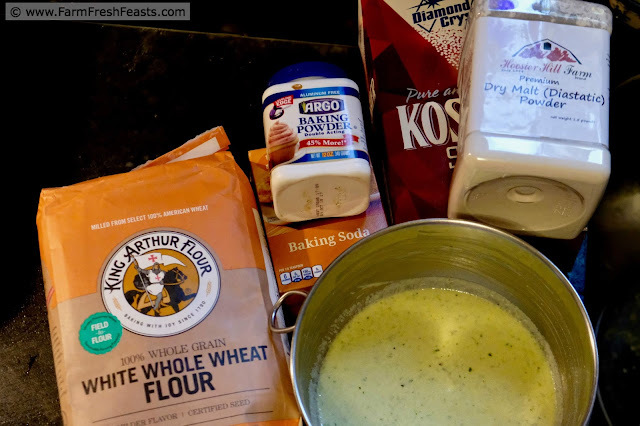 I've only used it for bagels, but forget that it is great in 100 percent whole wheat breads. Never thought about it for quick breads! These sound delicious! I'm definitely going to have to go through your garlic scapes roundup! Great muffins! I'm stalking the garden like a crazy person checking on my scapes daily. I'm waiting for a click more curl before snipping. I love the combination of scape pesto and ricotta here.